Dried apricots, cherries and raisins are simmered in wine and combined with oatmeal bread and pecans for a deliciously unique stuffing. Spread bread pieces on a large shallow baking pan. Bake 20 to 30 minutes or until lightly browned and dried, stirring occasionally. Bring wine, apples, apricots, and raisins to boil in medium saucepan on high heat; reduce heat. Simmer 5 minutes or until wine is absorbed. Remove from heat. Cool slightly. Cook and stir onions and celery in butter in large skillet on medium heat 8 minutes or until vegetables are tender. Remove from heat. Stir fruit mixture, pecans, salt and pepper into skillet. Place mixture in large bowl. Stir in bread pieces and broth. Remove neck and giblets from body and neck cavities of turkey. Refrigerate for another use or discard. Drain juices from turkey. Pat dry with paper towels. Fill neck cavity with part of the stuffing. Turn wings back to hold neck skin against back of turkey. Fill body cavity completely with stuffing. Place turkey, breast up, on flat roasting rack in shallow roasting pan. Spray turkey with cooking spray. 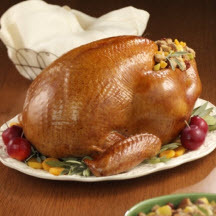 Bake 4 to 4 1/2 hours, or until meat thermometer reaches 165°F (73.8°C); when inserted in center of stuffing and 180°F (82.2°C); when inserted in deepest part of thigh. Cover breast and tops of drumsticks with aluminum foil after 2 1/2 hours to prevent overcooking of breast. Let stand 15 minutes before removing stuffing and carving.